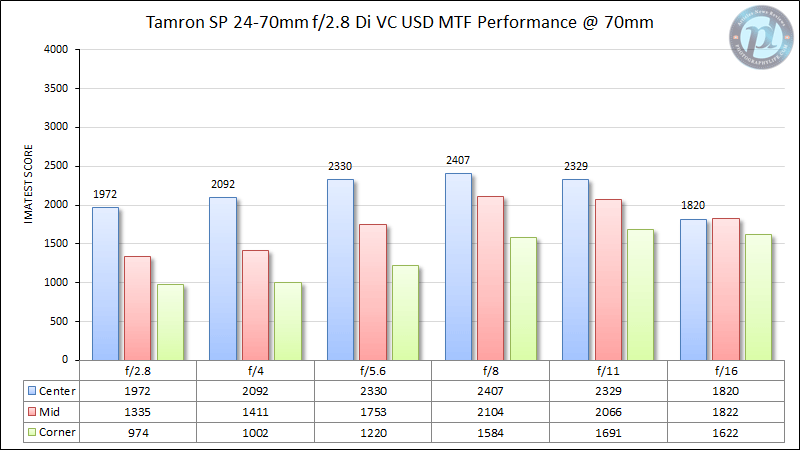 Some of the weaknesses of the Nikon 24-70mm f/2.8G, are its rather soft corner performance at large apertures and optical issues such as distortion and vignetting at the shortest zoom range of 24mm. One needs to be aware of these limitations and I personally often avoid using the Nikon 24-70mm at 24mm and large apertures. The Tamron 24-70mm f/2.8, on the other hand, has a different optical design that is actually optimized for wide open performance at 24mm. 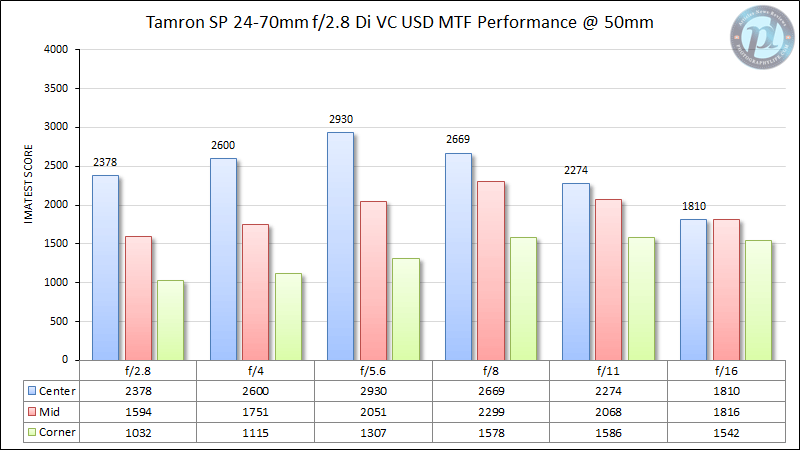 As you will see below, it is sharpest at 24mm and its performance deteriorates towards 70mm, with the worst performance at the longest zoom range. 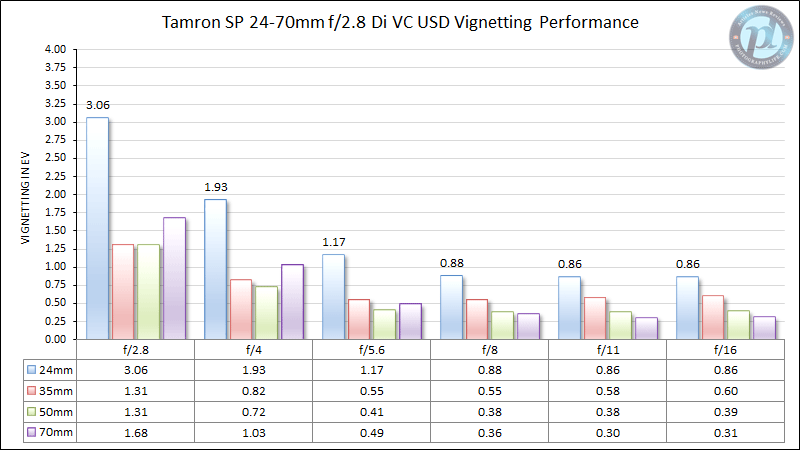 As noted earlier, the Tamron 24-70mm shows strong performance at the shortest end of the zoom range. It has excellent center and mid-frame performance at all apertures, with f/5.6 yielding the best performance. 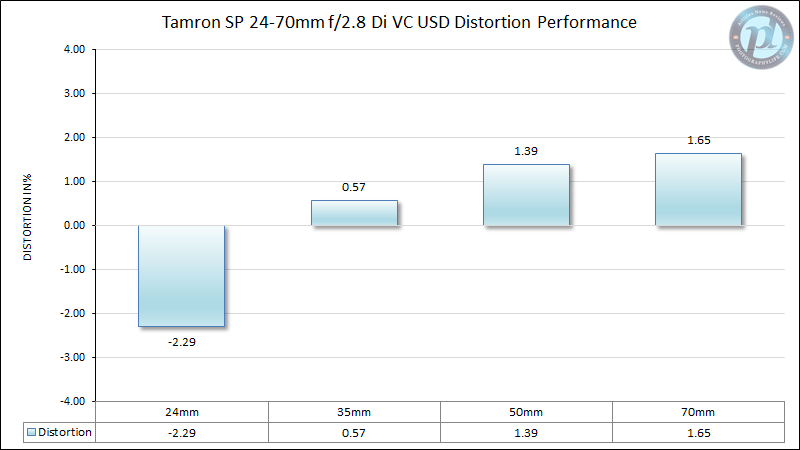 Its corner performance is also quite good, with best resolution figures at around the f/8 mark. As the focal length increases, the overall sharpness of the lens starts to suffer a little. 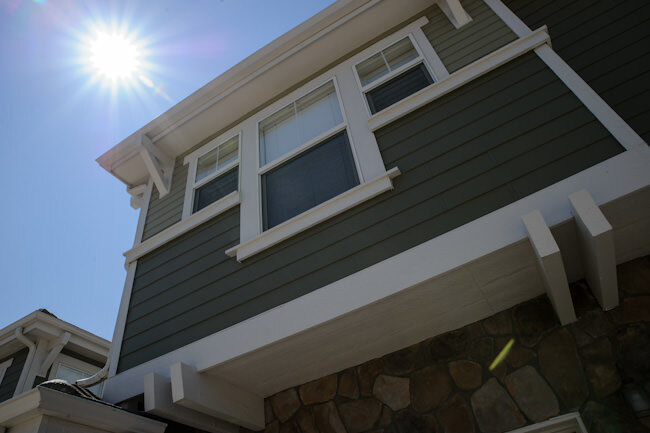 The center and mid-frame stay pretty strong at f/5.6 and f/8.0, but the corners do take a slight hit. At 50mm, the corner resolution improves slightly, but the center yields slightly worse figures than shorter focal lengths. And at 70mm, the lens is at its worst at all large apertures, with f/11 yielding the best numbers. There is a some straight field curvature that affects the extreme corners at all focal lengths, but it is not as bad as in some lenses. Unfortunately, the lens exhibits odd behavior when stopping down to f/4 from f/2.8 on certain samples. The image gets brighter and its diaphragm blades do not seem to change much between these apertures. At first, I thought the error was on my end, but as I tested the lens in different environments, I was able to reconfirm this behavior. You can see a clear example of this problem in the next “Bokeh” section below. So f/4 is not really f/4 on this lens. I thought it was just my lens sample that was showing this particular problem, but it turned out that I was not the only one – another local photographer who owns the same lens also had the same problem. It is hard to say how many samples out there have this particular problem, so I would encourage you to check your sample quickly and exchange it for a good one within the return window. As for contrast and colors, I found them to be similar to the Nikon 24-70mm, which is superb. With such a complex design and so many aspherical and low dispersion elements, it had better be! 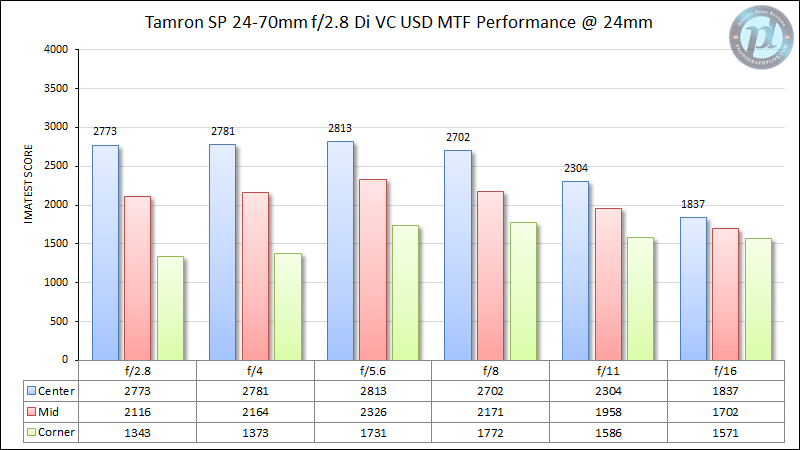 The Nikon 24-70mm f/2.8 suffers from pronounced field curvature issues, as I have already pointed out in my Nikon 24-70mm review. The donut-shaped field curvature it exhibits is rather annoying at large apertures, with decreased mid-frame performance on FX, which is pretty close to where the corner frame on DX is. 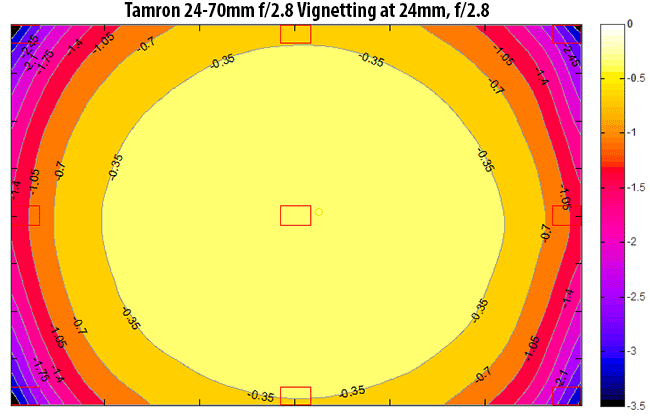 In comparison, the Tamron 24-70mm f/2.8 does not have major field curvature issues at 24mm, but does have the same donut-shaped curvature at 50mm and longer. 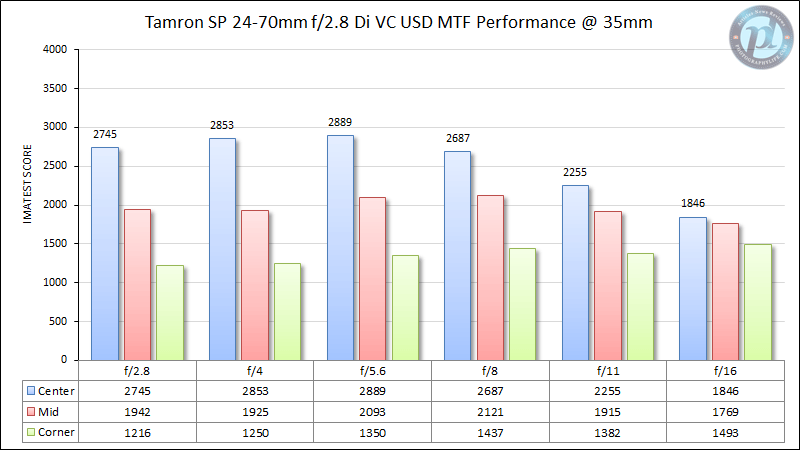 This can be clearly seen from the Imatest charts provided in this review, where you can spot a drop of mid-field performance at focal lengths above 24mm. As I have pointed out in the above section (Lens sharpness and contrast), you can clearly see what happens to the bokeh shape and size when the lens is stopped down from f/2.8 to f/4.0. 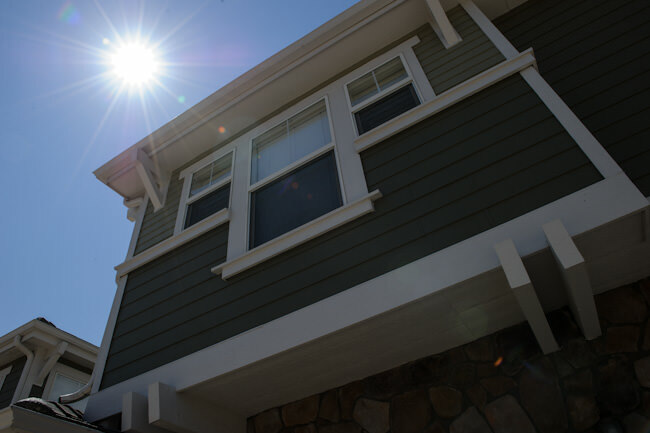 There is practically no difference between the two apertures – only brightness changes (had to compensate by -1 stop in Lightroom to make the above images comparable). Bokeh shape and size stay exactly the same. Now take a look at the Nikon 24-70mm f/2.8G on the bottom and note how different it looks between apertures. No need to describe the situation here – you can clearly see which one is better. 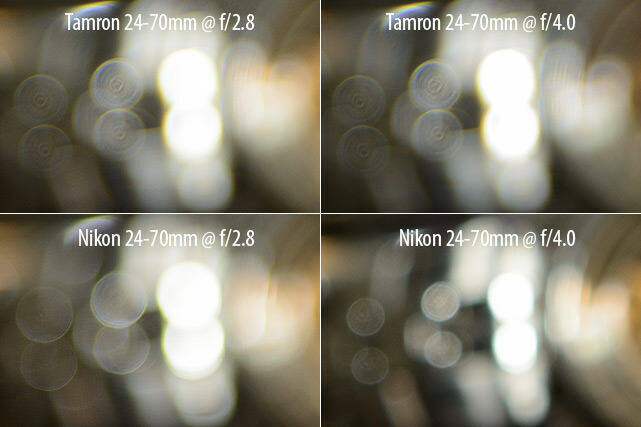 Overall, neither lens shows exceptional bokeh performance, but the Nikon 24-70mm is clearly better than the Tamron 24-70mm. The onion-shaped bokeh can be quite distracting on the Tamron 24-70mm and you can see the effect in both bokeh comparisons. If you are looking for a good portrait lens with beautiful bokeh, try the Nikon 85mm f/1.4G instead. From the above two image samples, the Tamron looks better to me overall. While the Tamron shows a little more flare, the Nikon 24-70mm shows a lot more ghosting throughout the frame. 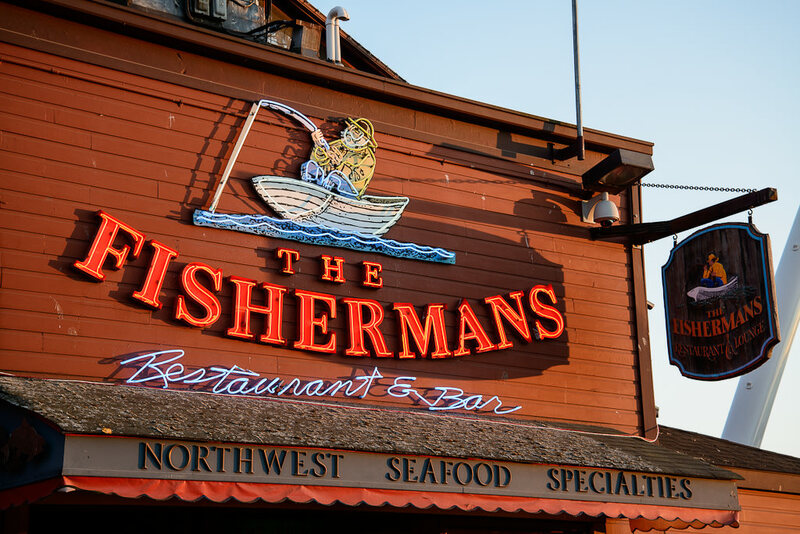 That’s why the Nikon 24-70mm has a huge lens hood – it just does not do well against very bright light sources. You could take off the lens hood on the Tamron 24-70mm and you would be fine, whereas I would not recommend to do the same on the Nikon 24-70mm. I personally do not worry about distortion problems on my lenses, because they are very easy to fix in Photoshop and Lightroom. The latest version of Lightroom 4 already has built-in support for the Tamron 24-70mm f/2.8, so the issues can be fixed with a single click using the Lens Correction module. 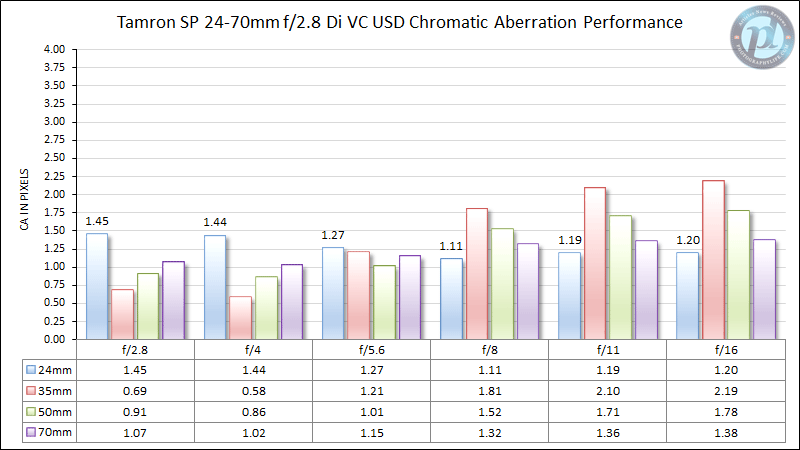 Similar to distortion, chromatic aberrations are also easy to deal with in post-production, so I would not be overly concerned about the above numbers. Let’s now move on to the good stuff – sharpness tests and comparisons.